We are a leading Manufacturer of rubber industry lubricating graphite blocks and lubricating graphite blocks from Navi Mumbai, India. 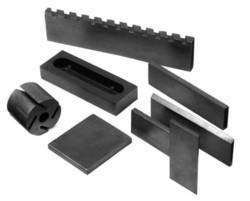 We provide Lubricating Graphite Blocks for Rubber Industry. Backed with decades of experience in this domain, we deliver our clients a wide gamut of Lubricating Graphite Blocks. Our professionals manufacture this offered range using optimum-grade raw material and cutting-edge technology, under the able guidance of our deft team of professionals.